Only compatible with Essentials v17.x! You may be asking yourself; why of all the people on the forum I decided to post yet another title screen script. 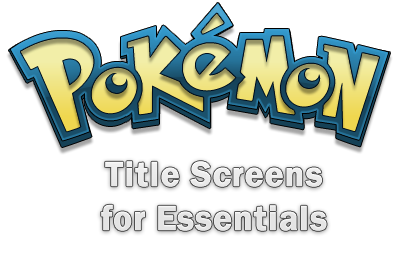 Unlike currently existing title screen scripts that lock you into a specific style should you be looking for a specific kind of animation, or just give you the ability to display static images; the Modular Title Screen resource gives you the complete freedom to construct your title screen however you see fit. Many of the old screen styles have been chopped up into individually addressable bits, that can be additively configured. You can construct an entirely custom and entirely animated title screen in just mere minutes. You can add as few or as many elements as you like. Some examples of what you can do with this system can be seen in the screenshots below, but it's safe to say that you have a lot of options at your disposal. The whole process of setting up this system is incredibly easy. First you'll want to go and download this pack, which you'll then have to extract into the appropriate location (namely the root folder of your project). After you're done with that, you just paste this script above Main, and you're done. Congrats! You've successfully set up the system. You'll notice the linked script looks a bit odd though. It mainly contains green text. That's right, the script only hosts your configuration constants. A lot has been commented in the script, documenting what you can use and how you can use it. Some presets have been left for you to explore as well. MAKE SURE TO READ THE BITS IN GREEN. Or else you won't know how to actually configure your animated title screen. The main idea just boils down to adding modifier names to a config array. In case you're looking for more details on what graphics the visual elements use, you can find a list of those here. Please credit the following for their contributions, when using the Modular Title Screen resource. More resources from Luka S.J. For those of you a little more curious about programming. The ultimate battle system add-on for Essentials! Make your map transfer one-liners; with a new twist! The best animated Title Screens for your fan-games! Great resource, super smooth and of course easy to use and modify. Great stuff!